ENTER #STARBUCKS DOUBLESHOT® POWER THROUGH FINALS 2017 SWEEPSTAKES. NO PURCHASE NECESSARY TO ENTER OR WIN. SWEEPSTAKES ONLY OPEN TO LEGAL RESIDENTS OF THE U.S. RESIDING IN ONE OF THE 50 UNITED STATES OR DISTRICT OF COLUMBIA WHO ARE 18 YEARS OF AGE OR OLDER (19 in ALABAMA or NEBRASKA) AT THE TIME OF ENTRY. SWEEPSTAKES SHALL BE CONSTRUED AND EVALUATED ACCORDING TO UNITED STATES LAW. DO NOT ENTER THIS SWEEPSTAKES IF YOU ARE NOT A LEGAL U.S. RESIDENT. SWEEPSTAKES BEGINS APRIL 17, 2017 AND ENDS JUNE 19, 2017. VOID WHERE PROHIBITED. 1. HOW TO ENTER: No purchase, and no entry fee, payment or proof-of-purchase necessary to participate in the Sweepstakes. The Sweepstakes begins on April 17, 2017 at 12:00:00 a.m. ET and ends on June 19, 2017 at 11:59:59 p.m. ET (the “Sweepstakes Period”). a) To enter via text message, use your mobile phone to text “SPECS” to 67076 during the Sweepstakes Period, to receive one (1) entry into the Sweepstakes. Participants must have a mobile phone with text messaging capabilities to enter by text message. By participating, participants agree to receive up to three (3) reply text messages per entry about the Sweepstakes from Sponsor. Participants entering this Sweepstakes via text message may incur a standard text message and data charge from their wireless service provider for each message sent and received. Check with your wireless service provider for details on these and any other applicable changes. You are solely responsible for any such wireless charges. Not all wireless carriers participate. b) To enter online, visit www.enterpromo.com/doubleshot (the “Website”), during the Sweepstakes Period, and follow the on-screen instructions to properly complete and submit an online entry. In the event of an identity dispute regarding an online entrant, entry will be considered made by the registered owner of the email address used for the online entry. Entrants entering online must have a valid email address. Any attempt by an entrant to enter more than the number of times authorized herein, including multiple entries by the same entrant using different email addresses, will invalidate ALL entries submitted by that entrant for the entire Sweepstakes Period. Proof of submitting an entry does not constitute proof of delivery. All entries become the property of Sponsor and will not be returned to entrant. Every entry must be manually keystroked and manually entered by the individual entrant; automated and/or repetitive electronic submission of entries (including but not limited to entries made using any script, macro, bot or game service) will be disqualified and transmissions from these or related phone numbers or IP addresses may be blocked. Limit one (1) entry per person/phone number/email address regardless of method of entry per “Day.” A “Day” is defined as a twenty-four (24) hour time period beginning at 12:00:00 a.m. (midnight) ET and ending at the following 11:59:59 (midnight) p.m. ET. A “Week” is defined as a consecutive seven (7) Day period beginning on a Monday at 12:00:00 a.m. ET and ending on the following Sunday at 11:59:59 p.m. ET. If entering via text message, the person submitting the Sweepstakes entry must be the authorized account holder/user of the mobile phone number, otherwise entry shall be deemed void. In the event of dispute over the identity of a potential winner, entries will be declared made by the registered user of the mobile phone number used at the time of entry, and potential winner may be required to provide identification sufficient to show that he/she is the authorized account holder/user of the mobile phone number submitting the entry. It is solely the responsibility of the entrant to notify the Pepsi-Cola Company (“Sponsor”) in writing if the entrant changes his or her phone number or email address during the applicable Sweepstakes Period by updating your profile on www.enterpromo.com/doubleshot. IMPORTANT: Proof of sending a text messaging or email does not constitute proof of delivery to or receipt by Sponsor. Entrants will be given the opportunity to “cancel” (or unsubscribe) each time they receive a text message by sending “STOP” to the short code above. 2. ELIGIBILITY: YOU MUST BE A LEGAL U.S. RESIDENT RESIDING IN ONE OF THE 50 UNITED STATES OR DISTRICT OF COLUMBIA WHO ARE 18 YEARS OF AGE OR OLDER (19 in ALABAMA or NEBRASKA) AT THE TIME OF ENTRY to be eligible to win. Potential winners may be required to provide proof of legal U.S. residency if requested by Sponsor to determine eligibility and as a condition of prize award. Employees Pepsi-Cola Company and its bottlers, Starbucks Corporation and all of their respective parents, subsidiaries, divisions, affiliates, suppliers, printers, distributors and advertising, promotional and judging agencies (collectively, “Sponsor and Promotion Parties”) and the immediate family members of each, are not eligible to participate or win. Prizes won by minors under eighteen (18) years of age may be awarded to minor’s parent or legal guardian who will be required to sign all legal prize acceptance documents. 3. PRIZES: Sixty-three (63) Grand Prizes will be awarded in total, (nine (9) Grand Prizes per weekly drawing, as described in Rule 4 below), each consisting of one (1) pair of unisex Snap Inc. Spectacles, in either black, coral or teal (color cannot be selected by winner and will be mailed out at random). Actual Retail Value (“ARV”) of each Grand Prize: $130. Limit one (1) Grand Prize per person/name/email address/mobile phone number/household. 4. PRIZE DRAWING: Prize winners will be randomly selected in weekly drawings from among all eligible entries received during that week. To be eligible for a weekly drawing, entries must be received by the date indicated for that week. Odds of winning depend upon the number of eligible entries received for each week. Non-winning entries will carry forward to subsequent weekly drawings. Each weekly drawing will occur on or about the dates indicated below and will be conducted by an independent judging organization whose decisions shall be final. 5. WINNER NOTIFICATION: Potential Grand Prize winners will be notified by phone and/or email at the phone number or email address provided by the entrant at the time of entry. Grand Prize winners may be required to claim their prizes within 72 (seventy-two) hours of notification by signing and returning an Affidavit of Eligibility and Liability/Publicity Release (where permitted by law). In order to claim Grand Prize, additional releases and/or waivers of liability required by any applicable sanctioning body may also be required as appropriate. In the event the Affidavit and Release is not returned within seventy-two (72) hours, Grand Prize may be forfeited and an alternate winner may be selected from among all remaining eligible entries. Sponsor and Promotion Parties are not responsible for suspended or discontinued wireless or online services which may result in a potential winner not receiving initial prize notification and/or his/her prize. A prize may also be forfeited in the event that any winner notification or prize returned as undeliverable without a forwarding address. Any portion of a prize not accepted by the winner will be forfeited. Upon forfeiture for any reason as stated within these Official Rules, no compensation will be given. Prizes will only be delivered to addresses within the United States. Unclaimed prizes will not be awarded. Allow 8-10 weeks after verification for delivery of Grand Prize. Sponsor and Promotion Parties are not responsible for any change in entrant’s mailing address and/or telephone number. 6. GENERAL: Prizes will be awarded and/or delivered only to addresses within the United States. Except as determined by Sponsor in its sole discretion, no substitution of prize is offered, no transfer of prize to a third party is permitted, and non-cash prizes may not be redeemed for cash value (unless at the sole discretion of Sponsor). Any difference between the approximate prize value and the actual prize value will not be awarded. Prize winner will be solely responsible for all applicable federal, state and local taxes on prizes. If applicable, winner may receive an IRS Form 1099 for the retail value of the prize. All other expenses on the receipt and use of the prize not specifically mentioned herein are solely the responsibility of the winner. Any portion of a prize not accepted by winner will be forfeited. 7. CONDUCT: By entering this Sweepstakes, entrants agree to be bound by these Official Rules and the decisions of the judges that shall be final and binding in all respects. The Official Rules will be posted on the Website throughout the Sweepstakes Period. Failure to comply with these Official Rules may result in disqualification. Sponsor reserves the right at its sole discretion to disqualify any individual found to be tampering with the entry process or the operation of the Sweepstakes or the Website; or to be acting in any manner deemed by Sponsor to be in violation of the Official Rules; or to be acting in any manner deemed by Sponsor to be unsportsmanlike or disruptive, or with intent to annoy, abuse, threaten or harass any other person. CAUTION: ANY ATTEMPT BY A USER OR ENTRANT OR ANY OTHER INDIVIDUAL TO DELIBERATELY DAMAGE ANY WEBSITE OR UNDERMINE THE LEGITIMATE OPERATION OF THE SWEEPSTAKES IS A VIOLATION OF CRIMINAL AND CIVIL LAWS AND SHOULD SUCH AN ATTEMPT BE MADE, SPONSOR RESERVES THE RIGHT TO SEEK DAMAGES FROM ANY SUCH PERSON TO THE FULLEST EXTENT PERMITTED BY LAW. 8. LIMITATIONS OF LIABILITY: Sponsor and Promotion Parties assume no responsibility or liability for (a) any incorrect or inaccurate entry information, or for any faulty or failed electronic data transmissions; (b) any unauthorized access to, or theft, destruction or alteration of entries at any point in the operation of this Sweepstakes; (c) any technical malfunction, failure, error, omission, interruption, deletion, defect, delay in operation or communications line failure, regardless of cause, with regard to any equipment, systems, networks, lines, satellites, servers, computers or providers utilized in any aspect of the operation of the Promotion; (d) any injury or damage to participants or to any other person’s phone which may be related to or resulting from any attempt to participate in the Sweepstakes. If, for any reason, the Sweepstakes is not capable of running as planned for reasons which may include without limitation, tampering, unauthorized intervention, fraud, technical failures, or any other causes which may corrupt or affect the administration, security, fairness, integrity or proper conduct of this Sweepstakes, then Sponsor reserves the right at its sole discretion to cancel, terminate, modify or suspend the Sweepstakes in whole or in part. This Sweepstakes is governed by the laws of the United States and the State of New York, without respect to conflict of law doctrines. As a condition of participating in this Sweepstakes, you agree that any and all disputes which cannot be resolved between the parties, and causes of action arising out of or in connection with this Sweepstakes, shall be resolved individually, without resort to any form of class action, exclusively before a court located in New York having jurisdiction. Further, in any such dispute, under no circumstances will Participants be permitted to obtain awards for, and hereby waive all rights to claim punitive, incidental or consequential damages, including attorneys’ fees, other than Participant’s actual out-of-pocket expenses (e.g. costs associated with entering), and Participants further waive all rights to have damages multiplied or increased. 9. RELEASES: All entrants, as a condition of entry into the Sweepstakes, agree to release Sponsor and Promotion Parties from and against any and all liability, claims or actions of any kind whatsoever for injuries, damages, or losses to persons or property which may be sustained in connection with accessing the Website, submitting an entry or otherwise participating in any aspect of the Sweepstakes, the receipt, ownership or use of any prize awarded, or while preparing for, participating in or traveling to or from any prize-related activity or any typographical or other error in these Official Rules or the announcement of offering of any prize. The winner shall bear all risk of loss or damage to their prize after it has been delivered. Sponsor makes no representations or warranties of any kind concerning the appearance, safety or performance of any prize. Except for residents of Tennessee and where prohibited by law, winners grant to Sponsor the right to print, publish, broadcast and use worldwide in any media now known or hereinafter known (including without limitation use online at the Website) the winner’s name, address, voice, statement, picture or other likeness, without additional compensation, for public relations, advertising and promotional purposes as may be determined by Sponsor. 10. 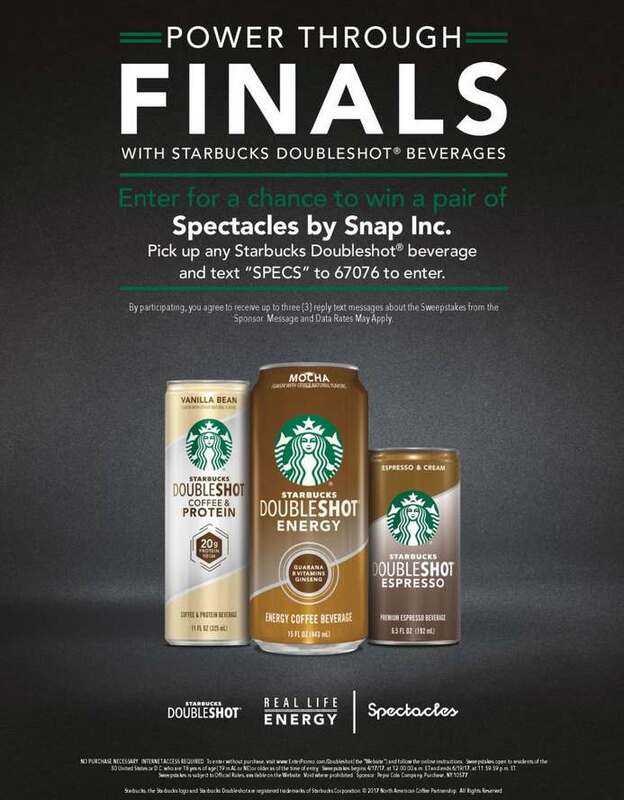 WINNERS LIST: For a list of the Grand Prize winners, mail your request before July 19, 2017 to: Starbucks Doubleshot Power Through Finals 2017 Sweepstakes Winners List Request, PO Box 941459, Maitland, FL 32794-0340. 11. SPONSOR: Pepsi-Cola Company, 1111 Westchester Avenue, White Plains, NY 10604. The Sweepstakes is in no way sponsored, endorsed or administered by, or associated with, Snap Inc. Snap Inc. is completely released of all liability from any/all claims based on, related to, or arising from the Sweepstakes. Starbucks, the Starbucks logo and Starbucks Doubleshot are registered trademarks of Starbucks Corporation. © 2017 North American Coffee Partnership. All rights reserved.